[0:05] <[Saint]> In what way? [0:05] <[Saint]> Just because a client is headless doesn't mean you won't what to export an X session over ssh at some point. [0:06] <[Saint]> Just don't run a displaymanager (which in turn won't start X) by default. [0:06] <[Saint]> Disabling lightdm (yet still eaving it, and X, available) is trivial. [0:29] <JK-47> Either way… big SD is cheap. [0:30] <JK-47> that the sodimm one? [1:27] <M3OW> would using a VNC server to turn my pi into a game controller cause input lag? [2:09] <[Saint]> t3chguy: doesn't mounting with netdev specifically wait for network interfaces to be up before mounting? [2:10] <[Saint]> IIUC, that's almost entirely why that mount flag exists. [2:56] <fred1807> who is the service/deamon that auto updates /etc/resolv.conf with dns servers ? [3:01] <fred1807> isnt bad pratice to make the file read only, and leave the service trying to write it everytime ? [3:01] <fred1807> shouldnt I actually disable such behavior of the service? [3:04] <[Saint]> I would consider that bad practice personally. It's just using a brutal method for lack of understanding the real activities involved. [3:10] <[Saint]> install resolvconf; run your favorite editor with root; edit either /etc/resolvconf/resolv.conf.d/head to prepend, or /etc/resolvconf/resolv.conf.d/tail to append; make edit(s); run resolvconf with the -u flag to apply. [3:10] <[Saint]> The "right" way to do this. [3:13] <JK-47> Or the right right way would be a config in dhclient-enter-hooks.d. [3:13] <JK-47> but, my way works and is easy. [3:14] <[Saint]> dhclient-enter-hooks isn't necessarily going to catch this. [3:14] <[Saint]> since networkmanager is entirely capable of sidestepping dhclient here. [3:15] <[Saint]> but resolv.conf.d will make your appends/prepends whenever resolv.conf gets touched by anything. [4:09] <fred1807> I dont have this command in my system "chvt" .. how can I install it? [4:10] <Berg> chvt command stands for CHange Virtual Terminal. It takes one option which is a number which tells it the virtual terminal to switch to. [4:10] <fred1807> i write, chvt 6, and i get "-bash: chvt: command not found"
[4:10] <Berg> do you have multi desktops? [4:11] <Berg> your teasing right? [4:36] <fred1807> how can I remove DHCPDISCOVER from the boot, and start it after the login screen? [10:54] <pabed> how can i read lm35 temp sensor by raspberry pi b+? [11:02] <pabed> raspberry does not have A2D? [11:03] <pabed> can i pwm for sensing temp? [11:04] <pabed> and is there any gpio that give me ? [11:07] <DoctorD90> ShorTie: sorry, that rf module how does it work? [11:09] <DoctorD90> being not my actual living word, may i ask you some feedback about that one? [11:11] <DoctorD90> and you can send command to it with? just 2 of them? [11:12] <DoctorD90> 1 send command to other? [11:13] <DoctorD90> there are settings to do? if another rf module is near to it, it goes in contrast? [11:16] <DoctorD90> ShorTie: so i can set up "my network", assign them an ID and send data to them :) ....for a quadcopter they seems good as way to control it.....range? [11:17] <DoctorD90> they are sender/receiver both rigth? [11:18] <ShorTie> your gonna use a pi for a quadcopter ?? [11:19] <mgottschlag> or is there any proper support for image recognition frameworks on the pi's gpu now? [11:21] <ShorTie> have you l00ked for a battery yet ?? [11:22] <ShorTie> and then the motors that have enough power to lift those, the pi and the frame to hold it all together ?? [11:26] <ShorTie> petrol motor, add a seat and have real fun ..
[11:27] <Berg> would you pre program a flight plan? [11:31] <Berg> what do they use in a already built one? [11:31] <Berg> what does u.u mean? [11:39] <Bhaal> How come there seems to be no v4l2-ctl for DRC ? [11:40] <DoctorD90> ShorTie: done....but they are ...*******...... they only be able to say "purchase from us controller xdiejdi393839je connect to pc, run gui, set dimension of rotor, disconnect, links cables, let's fly"......i asked them "esc use pwm rigth? mayni use i2c?" - asnwer "what is pwm? what is i2c?" - me "*closing door sound*"
[11:48] <Berg> i actualy use my python cod to write html on the fly so no reason you can do the same with the aduino stuf? [11:52] <ThinkingofPython> Coulda shoulda woulda! [11:52] <DoctorD90> may i ask you this sensor's link? [11:53] <ThinkingofPython> However though, when like 90% of sellers say they're from HK, they're not. [11:53] <ThinkingofPython> They're from China. [11:53] <ThinkingofPython> Berg I haven't yet, as I've had some money troubles. [12:13] <DoctorD90> ah!! understood now! [12:14] <DoctorD90> and for object position sensor what do you suggest? excluding ultrasonic sensor? [12:21] <ShorTie> and i've never read a book, lol. [12:23] <Berg> Kamilion: here ? [12:33] <DoctorD90> but this is ultrasonic...you said that ultrasonic may get bad feedback on not reflecting surface...or i have misunderstood? [12:49] <ShorTie> you know you gotta mount that vertical not horizontal right ?? [12:55] <DoctorD90> still remain decision between day/nigth camera :P infrared, or not infrared? [14:04] <annoymouse> Can a RPi serve as a viable means of hosting a Twitter bot? [14:33] <Bhaal> How come there seems to be no v4l2-ctl for DRC ? [15:17] <annoymouse> mgottschlag: How should I do that? [15:18] <t3chguy> then copy it to the Pi and execute it? [15:18] <annoymouse> Which OS should I use? [15:54] <knob> Odd question... I bought a piFace about 1 year ago (or more). When I went to finally use it yesterday, it didn't fit the newer rPis with the extended GPIO rack. What would you do? [15:54] <knob> Is there some type of extenders for the GPIO pins? Or should I hack something together? Something like the "Pi Gobbler"? [15:56] <IT_Sean> 6It should still fit. [15:57] <IT_Sean> Do the pins make contact? [15:57] <IT_Sean> no need "hack something together"... just get a GPIO ribbon cable from Adafruit or similar. [15:58] <knob> I saw in the piMagazine that there's a company in the UK that makes stackable "rPi shields"
[16:07] * IT_Sean is fixing it now. thanks for reminding me. [16:14] <IT_Sean> Don't go there, Bilby. [16:14] <IT_Sean> you will loose that game. [16:15] <ozzzy> professional? on IRC? [16:16] <Bilby> all you really have to do is remove that "rule"
[16:16] <IT_Sean> but untill then, it is what it is. mmm'kay? [16:16] <Bilby> since a) it's not a legally-bindign document anywawy and b) if the rules above it don't apply until that's said... why does that rule apply? [16:17] <annoymouse> Should I use NOOBS or just install Raspbian directly? [16:18] <annoymouse> Bilby: Can I multiboot with it? [16:19] <annoymouse> Do you know if Berryboot is still being maintained? [16:20] <Solarbaby> berryboot still works though. It's not a good experience. [16:23] <Solarbaby> thegorn: I wish I could say whether it's improved or not but I've not tried it. [16:41] <jancoow> does someone has any tips for searching the parts? [16:42] <jancoow> or other building tips? [16:42] <IT_Sean> Google is usually a good place to start. [16:46] <Bilby> what voltage does the LiPo put out? [16:48] <Solarbaby> t3chguy: I used berryboot recently and it was very broken. unstable. [16:48] <t3chguy> Solarbaby: I've used it 5 times now and had 0 issues, Pi1 or 2 and what sort of issues? [16:49] <Solarbaby> I did. I don't remember doing anything wrong. [16:50] <Bilby> jancoow, you definitely need a LiPo controller to handle battery charge state. What are you using for a motor controller? [16:50] <Solarbaby> t3chguy: it pissed me off that I didn't get full use out of it. like I said unstable. [16:51] <jancoow> bilby: should we talk in a private chat about that or do you wanna talk here? [16:52] <IT_Sean> Solarbaby: please mind your language, as per the channel policy. [16:53] <Solarbaby> IT_Sean: I must be tired. I will be mindful of the rules. [16:54] <Solarbaby> t3chguy: if I did that would I be able to avoid using berryboot? [16:55] <Solarbaby> t3chguy: I read somewhere that berryboot was slower. so You're recommendation is a pretty good idea. [16:58] <jancoow> Bilby: Also, keep in mind that all opto ESCs require 5V power and gnd from your BEC or FCB or Rx. They do not draw circuit power from the battery connection, so each ESC requires a 3-wire connection (to the FCB for example). So i think the 3 wires are for: ground, 5v, 5v pwm signal right? [17:04] <jancoow> or do you think the software pwm is fine? [17:10] <jancoow> and what do you think about the lipo battery controller? [17:11] <IT_Sean> yeah... they go BANG if mistreated. [17:12] <jancoow> is there a board for the raspberry pi? [17:12] <IT_Sean> keep the voltage and temp in spec for the battery. [17:12] <IT_Sean> you will need a battery controller for that. [17:13] <jancoow> but could someone suggest me a battery controller for the pi? [17:25] <jancoow> someone other suggestions? [18:03] <jancoow> in the mean time, could someone please help me with monitoring a lipo battery? [18:04] <jancoow> or could i just hook up some resistors to pull down the voltage and read it with a ADC ? [18:18] <jancoow> and is the temperature not important? [18:20] <jancoow> is a voltage divider something im looking for? [18:20] <jancoow> what do you suggest? [18:20] <t3chguy> what are you trying to do? [18:20] <t3chguy> monitor a LiPo battery without it being used or what? [18:23] <giddles> anyone with experience that could Halp me? [18:24] <jancoow> t3chguy: mm,, buck converter does convert the voltage down to a safe voltage to measure? [18:25] <jancoow> could you give me an example of a circuit? [18:25] <jancoow> does they exist? [18:32] <giddles> is there a google development channel? 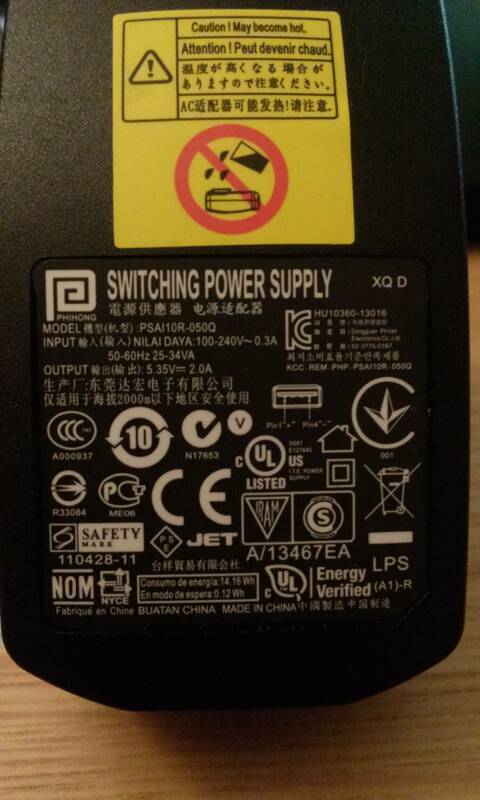 [19:02] <Blaxto> Hello guys, I have a question regarding power on raspi 2 model B, I bought my first pi today and I only had a 5.35v 2A PSU lying around, i know 5v is the limit but could the extra 0.35v be enough to damage my system? [19:03] <pksato> Blaxto: 0.1V out. [19:04] <pksato> And, have some loss on cable. [19:04] <Blaxto> so it should be fine, right? [19:04] <IT_Sean> Blaxto: the Pi is safe from 4.75v to 5.25v. the extra .1 will be lost on the cable. You will be fine. [19:04] <pksato> I think, is ok to use. [19:05] <pksato> 5.35 is on label? [19:05] <pksato> or is a measured value? [19:05] <giddles> my dealer wanted to save transportation cost? [19:07] <pksato> Blaxto: have a USB port? [19:08] <Kamilion> Someone pinged me? [19:10] <Blaxto> I would've liked to use a 2.5" since it would use less power and make less noise and I've seen some people do it but using a command to remove the limiter on the usb port, is this really safe to do? [19:10] <Kamilion> Berg: what'dja need? [19:15] <IT_Sean> Blaxto: you are trusting your drive (and the data it contains) to a $35 device made by the lowest bidder. Define "safe". [19:18] <IT_Sean> in that caase, you will be fine. [19:18] <IT_Sean> that's even worse! [19:18] <IT_Sean> I trust the lowest bidder! [19:19] <giddles> An error occured creating Drive client: 0AuthError: updateToken: unexpected HTTP status 400 bad request <-- anyone who have any idea? [19:22] <pksato> giddles: 400 bad request can be any error. no clue. [19:23] <pksato> ralated to connection procedure. [19:23] <pksato> a wrong method. [19:24] <pksato> not valid ssl key. [19:32] <Kamilion> t3chguy: that's somewhat bad advice; the thinner the wire, the more it will heat up when current flows through it. [19:33] <Kamilion> Blaxto: Get a good casing and a solid power source, the Pi is well built for it's price and size. [19:34] <Kamilion> Blaxto: your best bet is something like a Western Digital Blue-series or Green-series, as low RPM as you can find. 5400rpm or 4300rpm -- USB is not a speedy data bus, don't overspend. [19:52] <biberao> t3chguy: are you the t3chguy omxplayer --win? [19:53] <knob> The rPip is made by Sony? [19:53] <knob> News to me! [19:57] <knob> nid0, nice link... good info too. [19:57] <biberao> cant you still help me out? [19:58] <Kamilion> t3chguy: current is drawn; only the resistance of the wire would change that factor. The regulator will heat up exactly the same. [19:58] <Kamilion> the only difference might lie in the voltage drop from the length of cable. [19:59] <Kamilion> The easier solution is simply using a 'data only' cable that doesn't have the power conductors, and connecting to a powered USB hub. [20:00] <Kamilion> he already had that part taken care of. [20:01] <t3chguy> Kamilion: "18:04:25 @IT_Sean ‖ Blaxto: the Pi is safe from 4.75v to 5.25v. the extra .1 will be lost on the cable. You will be fine." [20:01] <Kamilion> yep, he's quite right about that. [20:02] <Kamilion> but as for power; an inexpensive monoprice cable with low-loss connectors is probably the best. [20:04] <biberao> t3chguy: so nope? [20:05] <IT_Sean> Guys... we're talkin about a tenth of a volt here... Use good cables, and stop worrying. [20:05] <Kamilion> and there's always the question of aluminum conductor, copper coated aluminum conductor, or pure copper conductor. [20:05] <Kamilion> in a related note, do not mix pure copper and pure aluminium. bad bad bad. [20:05] <thegorn> i agree that the .1 probably won't matter, don't agree that it will be "lost on the cable"
[20:06] <jancoow> could this one be programmed? [20:06] <Kamilion> I had a battery fire in my electric scooter because the previous owner replaced one of the cables with "really good automotive wire" but used aluminium connectors. [20:33] <ItsVoid> would it be something for kids too? [20:34] <mattrichardson> ItsVoid: Yes, Raspberry Pi is great for kids. In fact, it was created with kids in mind. [20:35] <ItsVoid> and is it HDMI only? [20:35] <mattrichardson> HDMI and composite video output. [20:36] <mattrichardson> One day there will be an official screen that attaches to a dedicated connector on the board as well. [20:38] <ItsVoid> I like it, small but powerful. [20:43] <ItsVoid> Anything else I need to know before buying a RPi? [20:44] <JK-47> ItsVoid: what do you want to use it for? [20:45] <IT_Sean> ItsVoid: please mind your language. The channel language policy is linked in the topic. [20:46] <IT_Sean> any decent USB phone or tablet charger should do. [20:46] <IT_Sean> the powah input on the Pi is a micro_usb port. [20:47] <mattrichardson> ItsVoid: Sounds like you're in good shape so far. [20:48] <mattrichardson> There's a good chance it will. Worth giving it a shot. [20:48] <IT_Sean> Sounds like you have most everything you need. [20:51] <mattrichardson> ItsVoid: 8gb would be fine. [20:57] <k_j> can rpi2 support 6,4V? [20:57] <k_j> even if you overclock? [20:58] <IT_Sean> you do NOT need to increase input voltage to overclock. Doing so will kill the Pi. [20:59] <k_j> what battery packs would you suggest? [21:27] <IT_Sean> darnit man... those are contagious! [21:28] <IT_Sean> t3chguy: I would go with a USB power pack. This way it's alreday the right voltage, and has all the regulation and charge management built in. [21:28] <IT_Sean> I wouldn't say 99%. [21:29] <IT_Sean> That's a gross overestimation. [21:29] <IT_Sean> True, SOME of them cannot be, but many can. [21:29] <IT_Sean> Pretty sure my Anker USB battery pack can. [21:30] <IT_Sean> And I know it'll run my Pi, as I've treid it. [21:32] <IT_Sean> I find that hard to believe. [21:32] <IT_Sean> Either that, or you are spending a LOT on battery packs. [21:36] <IT_Sean> t3chguy: I do not... Just look on Amazon for Anker USB battery. They make a bunch, in varying capacity. [21:49] <turtlehat> how much current can i safely draw from the 5v pin on the header? [21:50] <turtlehat> would 200mA be ok for instance? [21:54] <turtlehat> ah, so i should be fine, right? [21:55] <biberao> t3chguy: so you have no idea to help me? [21:58] <giddles> yeh it works! [21:58] <giddles> only god or *** or whoever knew why..
[22:45] <giddles> 3m coolant connector glue smells like..
[22:52] <Keanu73> Wish I had a RPi camera. [22:53] <Apocx> how bout you connect your pi to your tv and determine what resolution it reports in raspbian. and go from there. [23:18] <Keanu73> Does Raspbian use a vulnerable version of ntpd?